Frazey Ford, one of the founding members of celebrated Canadian folk trio the Be Good Tanyas, has been keeping busy. After releasing her first solo record, Obadiah to critical acclaim in July, she spent the summer touring North America and then scooted over to the UK to headline a tour across the pond with her band, the Quiet Revolution. But if you missed her, you're in luck: Ford has announced a new string of North American tour dates. 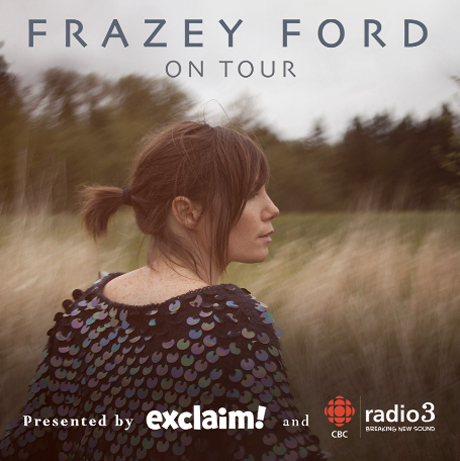 The tour – which is being presented by CBC Radio 3 and, for the purposes of full disclosure, Exclaim! – kicks off in Edmonton, AB on November 19. From there, Ford will play a handful of Alberta and BC dates before heading south down into the U.S.
Obadiah was released via Nettwerk Music and, if you've yet to hear it, combines Ford's mix of banjo and acoustic guitars with a gospel-type vocals. The album also features appearances from ex-bandmate Trish Klein, Ford's next-door neighbour and even her landlord. * Presented by CBC Radio 3 and Exclaim!